What can you say about a comic book movie so inept that it misses the point of the traditional Marvel post-credits teaser scene? Bear in mind, The Amazing Spider-Man 2 is not a Marvel Studios film. Sony/Columbia (mis)handles the Spidey franchise, but taking a cue from the Marvel Cinematic Universe, they included a mid-credits montage of scenes from Fox’s X-Men: Days of Future Past. 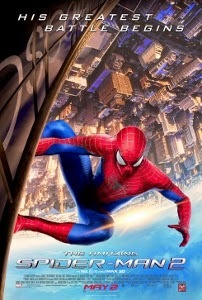 I’m not sure why Sony decided to promote another studio’s product, but the very fact that they apparently thought fans would want to hang around to see the credits interrupted by a commercial for a wholly unrelated film is, perhaps, indicative of why Amazing 2 fails to amaze on all levels. The film, a sequel to the underwhelming (but at least competent) 2012 The Amazing Spider-Man, is a loud, garish, stupidly illogical mess. If anything, Amazing 2 is a throwback to the pre-Marvel Studios, pre-Nolan days of comic book films. This is a disaster nearly on the level of Joel Schumacher’s Batman Forever and Batman and Robin. The first Amazing suffered from having to retell an origin story we saw only a decade before (in Sam Raimi’s Spider-Man) and from a ho-hum villain, Dr. Curt Connors (aka The Lizard). 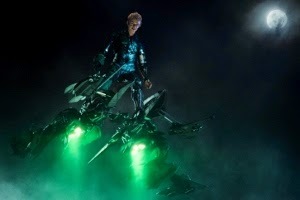 The sequel tries to overcompensate by tripling the villain count: Green Goblin (Dane DeHaan), Rhino (Paul Giamatti), Electro (Jamie Foxx). The best that can be said for Electro is that Foxx doesn’t go too far over the top in the role. The shy, insecure Max Dillon finds Foxx his The Soloist persona. We get the most perfunctory of back stories, depicting Max as a friendless loner with a serious Spider-Man obsession. He works as an electrical engineer at Oscorp, where an accident involving electric eels transforms him into the blue, glowing Electro. 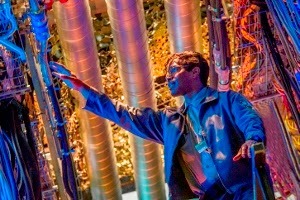 Despite Foxx’s best efforts, Electro is a useless character – a generic bad guy who serves no other purpose than to provide reasons for action set pieces (of which there are too few, considering the film’s two hour and 22 minute running time). Plus, we see that as Electro consumes more electrical power, he essentially morphs into a pure energy force that can materialize and disappear at will. So why is he vulnerable to becoming tangled in Spidey’s webs? It seems that a transparent, ghostly cloud of electrical current would not be physically stoppable, yet he is. This kind of slapdash inconsistency makes Amazing 2 feel more suited to Saturday morning cartoons rather than a feature film. Grafted onto the Electro nonsense is Harry Osborne – whose entire arc (including the death of his father, his inheriting of Oscorp, and subsequent transformation into the Green Goblin) is treated like as an aside. It doesn’t help that DeHaan, hampered by a God-awful costume and makeup, plays the Goblin just like Evil Ed from the original Fright Night. Then there’s Giamatti, the saddest waste of all. The great actor is forced to play what is essentially a live-action cartoon, bookending the film as Russian gangster Aleksei Sytsevich. The opening action sequence, with Spider-Man in hot pursuit of Sytsevich’s stolen truck, is actually the most excitingly-staged of the film. 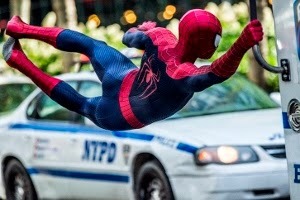 Here, director Marc Webb strikes the right balance between breathless action and lighthearted fun, with Garfield ably tossing off wisecracks while trying to recover vials of stolen plutonium in time to attend his high school graduation. We forget all about Sytsevich as Amazing 2 lurches through an outright boring second act and the labored climactic bout between Spidey, Electoro, and the Goblin. Then out of nowhere, as if two climactic battles weren’t enough, Peter is called into action yet again as Sytsevich reappears in his laughable Rhino armor to rampage through the city (even patiently pausing his maniacal attack in order for Peter to shuttle a young boy back to his mom). The Rhino closer is there primarily to lift the mood after (big spoiler alert; stop now if you don’t know the story) the tragic ending in which Peter’s girlfriend Gwen Stacy (Emma Stone) dies as he’s trying to save her from the Goblin. The demise of Gwen is easily the best element of Amazing 2. It brings a palpable sense of loss and gravity to the proceedings. It helps that the Peter/Gwen relationship is played with such sweet sincerity by Garfield and Stone. They make a good team, with Gwen stepping up several times to help Peter as he battles Electro. Garfield flirts with smartass annoyingness in his portrayal of Peter, so when the finality of Gwen’s death hits him, it really changes the tone (for the better) and is enough to make one look forward to seeing the character evolve in the next installment. But Webb and company trash all that by inserting the lunacy of the Rhino battle to close things out.